We love planning weddings at the Four Seasons in Santa Barbara. It feels like home to us. I guess if your home was a Spanish style mansion with well manicured gardens… okay, so we are really good dreamers. The Four Seasons service is top notch- it is sort of this awesome mix between, have I been here too many times – why do they know my name? Mixed with, damn they are good and did they really just give my dog a biscuit and welcome her back? - Pick your jaw up off the floor, sort of good. That level of service is consistent throughout the resort, which is why it really is easy for us to highly recommend the resort to clients. Margot and Rob came to us without a location. It wasn’t until we toured the Four Seasons and specifically the La Pacifica Terrace with its sweeping ocean views that they knew this was their perfect venue. It sort of made sense, being that Rob had proposed to Margot on Butterfly Beach in front of the Four Seasons. With the location set we worked with Margot to create an “understated elegant” event that had a fun Santa Barbara feel. 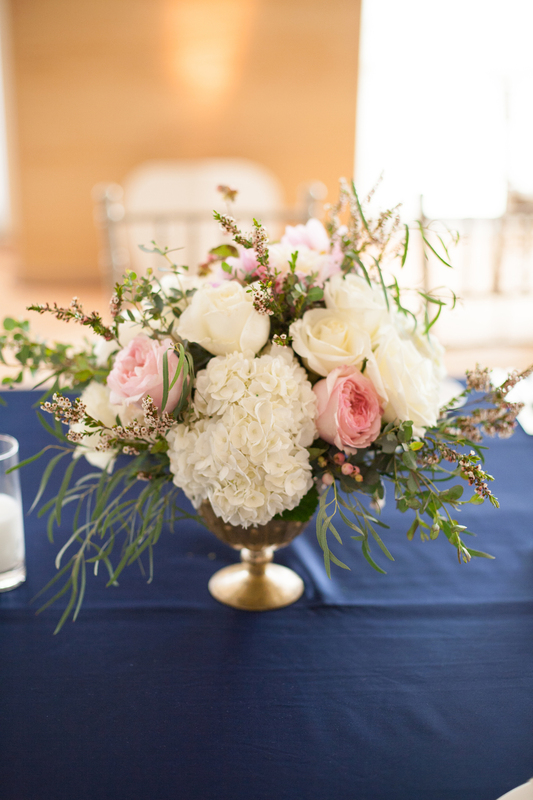 Margot shared with us her love of flowers, the colors navy, blush and champagne and their combined desire to keep guests dancing all night long! 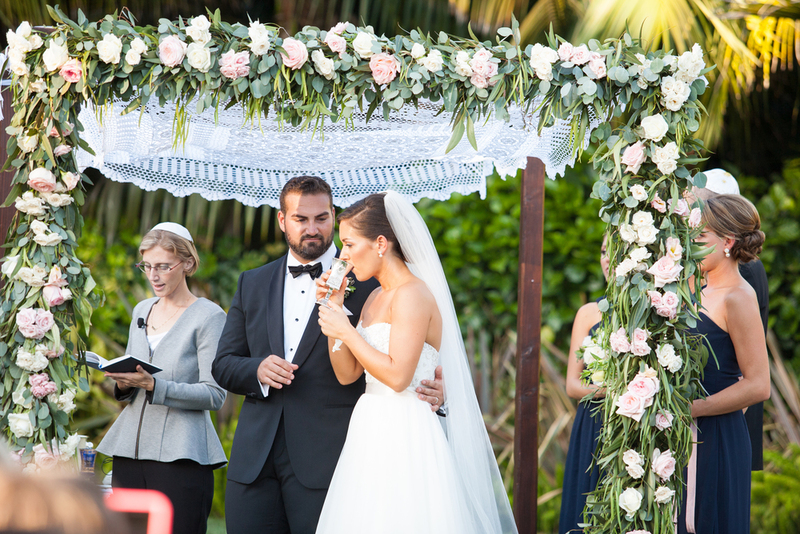 Margot and Rob’s ceremony was on the Monte Vista Lawn under a vintage lace chuppah designed by Rock Rose Floral. 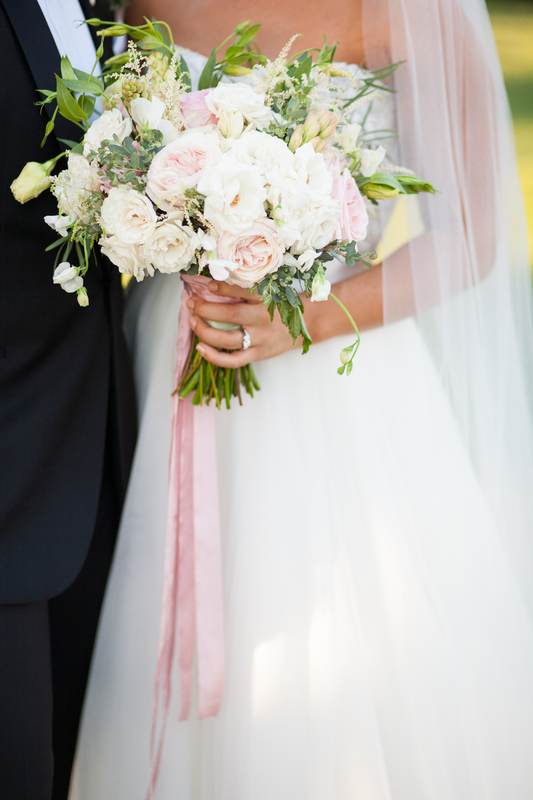 Margot carried a lush hand- tied bouquet in shades of white, blush and green with ample garden texture. 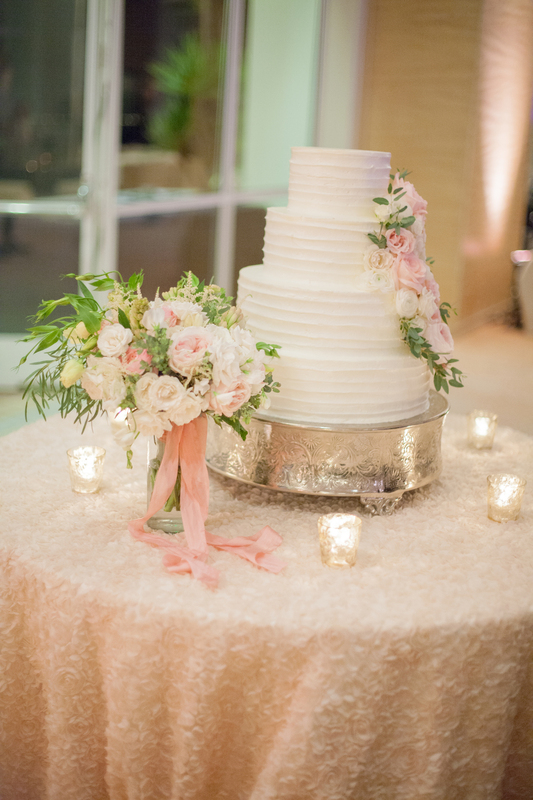 It consisted of various garden rose varieties, green foliage and soft floral textures. Guests were greeted by the Four Season’s beverage cart filled with ginger jars of homemade lavender lemonade and mint iced tea and an assortment of cookies. 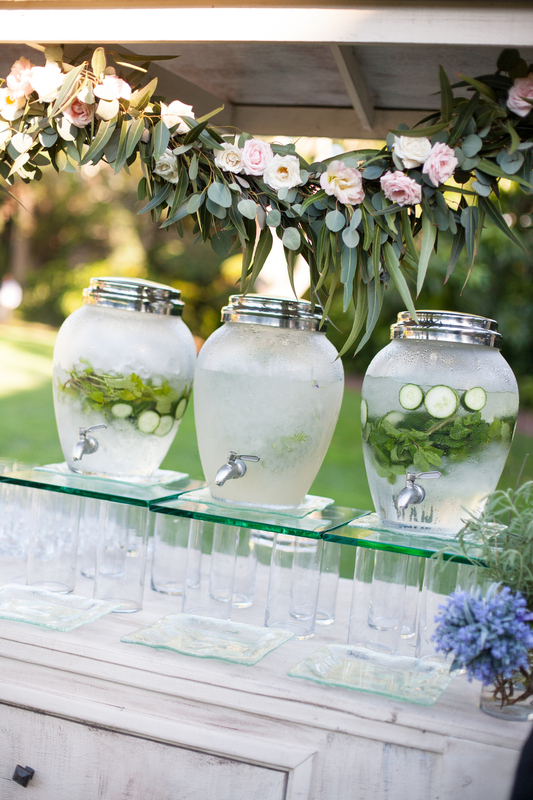 We find that guests really enjoy a cool beverage and snack before sitting down for a ceremony on a hot day. The cart was adorned with a garland and was the perfect accompaniment to the lush garden atmosphere. After the ceremony the guests were greeted on the La Pacifica terrace with champagne and appetizers. They enjoyed appetizers while playing corn hole, taking turns in the Open Air Photo Booth and watching the sunset over the Pacific Ocean. As the doors opened the band began to play and guests took their seats at long feasting tables filled florals, garlands and candles. The toasts were so thoughtful and emotional- we found ourselves crying tears of joy for the happy couple. The first dance as husband and wife was perfection and the parent’s dances led to more tears. Once the dance floor opened the guests never sat down. We had fire pits and lounge furniture set up outside, so guests could chat and enjoy an after dinner drink while staring at the ocean, which Bella Vista Designs had illuminated, so you could see the waves crash- magical. All in all it was a special and fun night filled with lots of special touches. We are so honored to design and plan Margot and Rob’s wedding day and so very grateful for our fabulous vendor team.